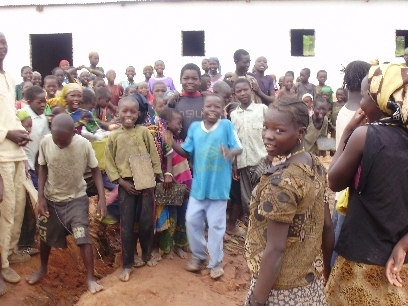 Orphans Celebrate Their New Home and New Well. On this Thanksgiving Eve we at Hope Springs International have so much to be thankful for. Because of generous hearts clean water is now flowing from 26 repaired wells and 35 new ones in Dono-Manga, Chad. Our new dispensary recently government certified as a “Health Center” is seeing over 1000 patients per month. Our 41 orphans have a new home. While only 7 of the 41 have sponsors, these funds are providing basic food needs for the children. We are also thankful for the new churches that have been established and the hundreds that have become Christians because they have seen the love of Christ in action. We are thankful for each of you who have allowed God to use you in making all these things possible. May Father’s richest blessing be your on this Thanksgiving Day. Categories: Chad, Children, Clinic, Dispensary, Dono-Manga, New Wells, Orphanage, Orphans, Water, Well Repair | Tags: Thanksgiving | Permalink. “The combined work of the dispensary, new water wells and orphanage in Dono-Manga continue to bring glory to God as souls are being added to the Kingdom on a regular basis now. There were twelve baptisms last week. Contaminated water is no longer an issue because the new wells drilled continue to provide sufficiently for both human and livestock needs. We learned earlier this month that 40 to 50 people per day are being seen at our Dispensary. That is over a 1000 people per month that are receiving much needed treatment. We have also just received word from Dr. Eni, who is a teaching surgeon on staff of the University of Maiduguri Teaching Hospital in Maiduguri Nigeria, and a consultant for our work in Dono-Manga, that our dispensary has been granted the status of “Health Center” by the Chadian Government and is now authorized to aid pregnant women with child delivery and preform minor surgery. When we visited Dono-Manga one year ago this month the dispensary was nearing completion and the Orphanage and new wells were just a dream. Now that they are all a reality, lives are being saved, orphans carried for, an abundance of clean water is available, and the Gospel of Christ is being preached and spiritually thirsty souls are being saved. Your one time or monthly gifts are needed as we continue this great work. Live are being saved physically and spiritual. Send you gifts to 118 Wessington Place, Hendersonville, TN 37075 or you can make donations on line at www.hopespringsint.com . Categories: Chad, Clinic, Dispensary, Dono-Manga | Permalink. Concert Tickets are $10 each. You may purchase tickets at our Website: Hope Springs International by clicking the PayPal Secure Donation Button. All tickets purchased online from now through November 30, 2011. will be mailed. 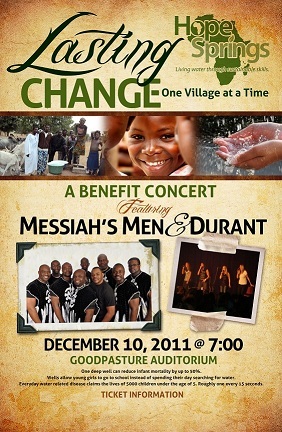 Tickets purchased December 1-9, 2011 will be available at the “Will Call” table at the concert. Tickets are also available from a number of Churches and individual in the greater Nashville area. Family and group rates are available. Tickets will be available at the door the night of the concert if seats are available. For more information email us at: hopespringsinternational@yahoo.com. PLEASE NOTE THE DATE CHANGE FROM THE 9th to the 10th. 619 W. DUE W. AVE. Categories: Benefit Concert6 | Tags: Benefit Concert | Permalink.